The habit of buying greeting cards is a big industry and Hallmark thanks you every time you go buy a birthday, Valentine's Day or anniversary card. Now you're thinking if I forget to get a card for either occasion I am going to be in big trouble with my spouse...Wrong... let us show you how we save money and have a lot of fun in doing so. 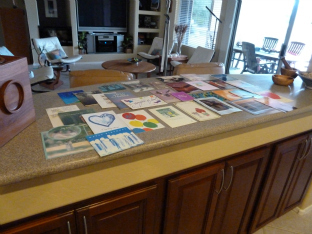 In the picture that you see, there are over 30 anniversary cards... we keep the anniversary cards, birthday cards, Valentine's Day cards that we bought for each other in the first 20 years of our marriage... when we were working. Now we keep these cards in separate folders and put them all over the house the night before whatever it is we are celebrating... We enjoy looking back and reminiscing about what we were doing when we bought these cards in the first place. If you're not in his habit now, it's not too late to start... instead of throwing away a card that cost five dollars away, keep them, recycle them every year. It will also eliminate panic runs to the mall or the drugstore when you realize you have forgotten to get something for your spouse's birthday, Valentines day or your anniversary. You will find that you can save $20-$30 a year very easily... it's a very easy way to save money. Now I realize that this will never make me very popular, with Hallmark and the other greeting card companies... but this is a very easy way to save money. Seemingly little things like not buying anniversary or Valentine's Day cards, can add up, and that is what frugal retirement living is all about. Besides, it's interesting... sometimes depressing... to realize how much your handwriting changes over the years... but it's fun to look at a card that we gave each other for our fifth anniversary, now 33 years later... the hair may be gray, in my case white, and think what we were doing, and where we were, when we gave each other the cards...it's the thought that counts. A tradition in our house, is to make up a bunch of sticky notes, and hide them around the house, in addition to placing out the old cards. 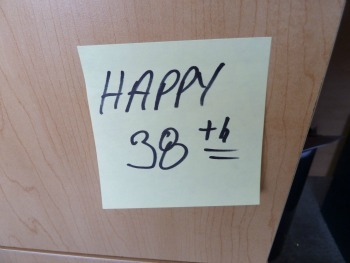 You can be creative here, like " 38 and feeling great", or " I want 38 more" ( that would make me 105...hmmm)... and so forth. It can be a game to see how long it takes each of us to find all the notes that are hidden in... the freezer, my golf bag, underneath the printer cover, in a seldom used closet, on the vacuum...(Am I a romantic or what? )...you get the idea, it makes each holiday fun without going to the mall and paying five bucks per card. Thanks for reading greeting cards...an easy way to save money.